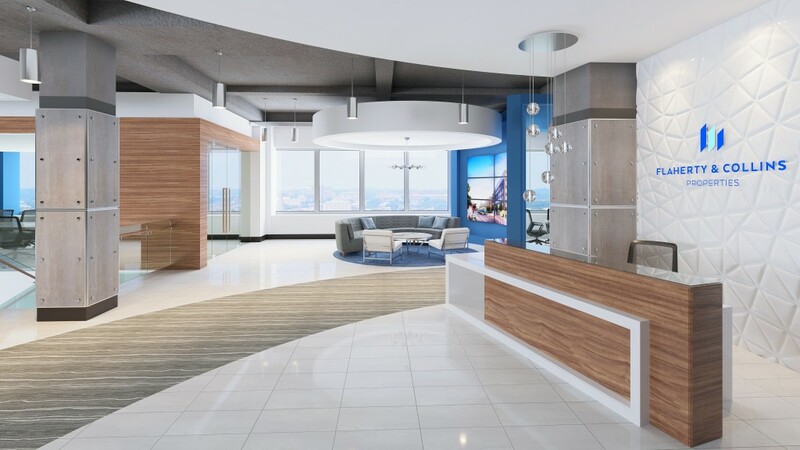 INDIANAPOLIS, IN – Flaherty & Collins Properties has announced plans to move its corporate headquarters and over 75 corporate employees to Regions Tower in Downtown Indianapolis. Flaherty & Collins Properties specializes in mixed-use developments and public/private partnerships of multifamily housing, in both luxury, market rate and affordable housing. The firm is comprised of development, management and construction divisions that comprises over 450 total employees throughout the country. The company will bring over 80 high-paying jobs to downtown Indianapolis, a move that ties in well with the company’s development philosophy of urban, mixed-use projects set in the heart of a downtown area. Currently, Flaherty & Collins Properties manages 109 properties and over 15,701 units nationwide, with over one-half billion in projects under development in Indianapolis, St. Paul, Kansas City, Tulsa, Cincinnati, Chicago, Washington, D.C., Covington (KY), New Albany, Kokomo, Mishawaka and Elkhart. The company will occupy the 30th floor and part of the 29th floor at Regions Tower for 24,493 square feet of space. Flaherty & Collins Properties will move into the space later fall after building out the office area with high-end amenities and finishes. Mitsch Design will oversee the design and buildout of the space. The move and office space design go hand-in-hand for Flaherty & Collins Properties, which has been headquartered on the North side of Indianapolis at Keystone at the Crossing for the past 12 years. While the current office space features brass and traditional wood paneling, the new space will feature bright colors, glass walls and high-end finishes, Flaherty said, to give the space a modern and sleek look. The space also will be open to encourage interaction, and intermixed with treadmill desks, a Golden Tee golf arcade game and either shuffleboard or a pool table to help employees blow off steam. John Crisp of Cushman & Wakefield represented Flaherty & Collins Properties in its search for new space. In business since 1993, Indianapolis-based Flaherty & Collins Properties is an award-winning developer, builder and manager of mixed-use, multifamily properties. The firm manages 15,700-plus units and 109 properties across 13 states and has over a half billion in development in Indianapolis, New Albany, Kokomo, Tulsa, Kansas City, Cincinnati, St. Paul, Chicago and Washington, D.C. For more information about the company, go to www.flco.com or call 317-816-9300.